People look for, review, ask for recommendations for and talk about businesses every day online. Because of this, your business online reputation matters a lot. That can be a good thing or a bad thing depending on who you talk to. There’s a fair amount of things that can go wrong when it comes to the conversations consumers have online. You might find misinformation, bad-mouthing, or just general negativity about your brand (but mostly politicians). I’d like to think only good things happen on the internet but I know that just isn’t so. Have you read the comments section of a news article on Facebook? It’s not good! Your business online reputation happens with or without you which is why you need to manage your online presence. Most of it largely happens on the internet today. That can be both a good thing and a bad thing for your business. Everything happens online in the 21st century. 77% of Americans (Pew Research Center) have a mobile device in their hand… right now! I made up the “right now” part but just walking around in public you can noticeably see how attached people are to their phones. Whether we like it or not, people are glued to their phones everywhere they go. Just hopefully not while driving. 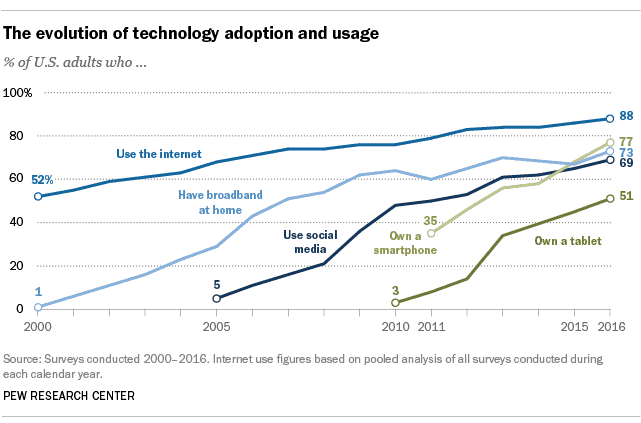 Even more people use the internet. 88% according to the same Pew Research Center study cited above. It sure seems that a large part of the population is online. Surely SOME of that has to do with consumption of something like food, services, stuff, etc. What time is left over after playing games and watching YouTube video on the internet is probably spent on some sort of consumers activity. That consumer activity is partially reviewing, making fun of (I hope not! ), or just all around saying something about the thousands of brands of the world. The internet is a darn mess of tangled spaghetti. Untangling it and finding the relevant parts to you is the hard part. As a business owner, you want people to come to visit you and spend money. What better way is there to do that than to get into that little device that everyone’s face is glued to? Of course, that means you want people to talk about you online. Guess what? It’s already happening. There are millions of conversations happening every hour online and your brand is part of that conversation cloud (or spaghetti, whichever you prefer). Whether it’s good or bad is a mystery though. Because so much of these conversations happen online, your business online reputation matters more than ever. If one negative thing gets out there and you don’t mitigate it somehow then it could spiral out of control. The next thing you know your business is crushed by 20 negative reviews and you have no clue what happened. People just stop coming. Advertise, promote, wave signs, whatever you do doesn’t bring any customers in. That’s why your business online reputation matters. It’s absolutely essential to stay on top of your digital reputation. The conversations happen more than just on review websites. There are a number of places you have to monitor though admittedly review sites are the most important. People always talked about businesses. The good and bad always existed. It was different though because it all happened in a silo. How did we find businesses back in the day before the internet? I don’t remember the days before the internet but I do remember a day before internet reviews. It was either the local restaurant we went to or what we found in the yellow pages. I’m thankful that not every restaurant in town jumped on the AAA, AAAA, A+, etc train. It seemed every auto repair shop had some sort of blend that started with A and had a + in it. Of course, that’s all to get to the top of your category in the yellow pages. As it is today, it was important to have excellent customer service as opposed to mediocre service. If you had mediocre service then it could also be bad with a similar effect on your business. Good service: people would recommend you (verbally of course) to their friends and family. This would multiply but very slowly. Personal relationships were formed and you knew the regulars who were telling others to visit you. Mediocre service: people would find you, come to visit you, not be overly impressed and then leave. None of these customers would come back or recommend you. It’s an expensive game always trying to get more customers only to have them never come back. Bad service: people would visit you, not have a great experience and would never come back. They might tell a few people they didn’t like your business but the message didn’t spread too far. Good service could make your business grow a lot in those days but bad service could never hurt you too badly. Bad service only hurt you in the sense that they wouldn’t come back which is about equal to mediocre service. Today, good service can make you grow a lot but bad service can absolutely devastate a business. Back in the day mediocre and bad service was the same thing, neither hurt you too badly but they didn’t help either. Now they are 3 distinct categories and bad service cannot happen. We know now how important a role the internet plays in our business online reputation. But where is all the talk happening? The internet is a big place with a lot happening. Take the real world and multiply it by 1,000. Probably automation and the ability to rapidly spin up content. Of course, most of that content is garbage and will never be seen. For every blog post I write it can sometimes get replicated up to 5 times. For bigger websites that’s probably more like 20 times. That also means there’s a lot of places where the conversation about your brand can happen. The good, the bad, and the ugly happens on every website you can imagine and it’s hard to keep track of it all. Business online reputation is a challenge today because it’s so easy for everybody to create content for good or bad. So where does all this conversation happen? Many, many websites online. It can happen on review sites, social media, blog/news, and of course forums and comments. I’ll go over some of these and how they can be used to talk about a brand. This is the most common place businesses focus on when managing a business online reputation. That makes sense given it’s usually the first place a consumer will see when they’re looking for a business (after Google though). These are websites such as Google My Business, Yelp, Foursquare, Facebook business pages, and more. There are specialty review sites too for every industry you can imagine. Lawyers, contractors, travel, marketing, and more all have their own special review websites. There’s more than can be tracked manually. These reviews are extremely important because they can drive a lot of business. If you have 2 reviews averaging 4.7 stars and your competitor has 10 reviews at 4.6 then you have some catching up to do even with the slightly higher average. Luckily there are some easy and highly effective solutions to manage online reviews including do it yourself review management methods to get more of and manage your reviews. The first place consumers often look is the big review sites. That doesn’t mean specialty sites aren’t just as important though. Some specialty sites rank higher than the big review sites for important local keywords. The importance of a business online reputation goes beyond just review websites though. Not many reviews happen on social media except for some on Facebook business pages. But reviews aren’t all that matter for a business online reputation. Conversations happen between friends, family, and strangers on social media. People talk and social media is where a lot of that talk happens. You might be surprised how much your brand is mentioned on social media. No matter what is said, good or bad, on social media it’s good to keep a finger on that pulse. Just because you don’t know what’s being said about your business on social media doesn’t mean people aren’t talking. There are a lot of different ways your business could end up on blogs or news websites. It’s not always about being featured in the news either. There are many local bloggers in your backyard that you may not know about. Your brand could be mentioned on their blog which could be a good thing or a bad thing. You should know about it though. You could be featured in the news without even knowing that you were going to be. That’s a great thing unless your brand is tied to a negative story. If so, you at least can brace for the fallout and mitigate the negative as much as possible. If you are featured in a positive news story then great! You still want to know about it so you can piggyback off that positivity. Everyday information is published all over the internet. If your brand is mentioned then that becomes part of your business online reputation. This one can be a doozy. There is social media and then there are also forums. Forums are a whole different beast entirely. And yes, people still use forums, a lot! There are probably local forums in your area that are still frequented quite often. There are often mentions of brands in those forums also. Comments are a bit less likely but it can still happen. People don’t forget about your business once they visit you and leave. You’re in their memory and something they read can remind them of your business. It’s quite possible a consumer might comment on a news story or blog post about a general topic (top 10 places to eat in San Antonio) with a mention about your business. You’d want to know about that right? All that information is a lot to keep tabs on every day. Managing your business online reputation is no easy task. There are some things you can do to manage your reputation though. Google offers one (supposed to be) powerful tool to do this. It’s not always the most accurate but you take what you can get for free. Here’s how you can manage your business online reputation in each of the categories I mentioned. If you set all your profiles up then these sites probably have your email address (make sure it’s accurate). When someone leaves a review you should get an email. If you haven’t set up your business on review sites then you have some catching up to do. You want to be sure you set up all your profiles accurately and completely. I’ve written posts to help you get set up on Google My Business, Yelp, Nextdoor, and Facebook. There are hundreds of review sites though. I cover 3 different ways you get set up on local directory websites. The easiest way to get setup everywhere and monitor your presence on local directories is with a local directory management service where I publish, and optimize business listings to get ranked higher in search results. There are also options for managing this yourself with apps like Yext and Local Reach which partners with Yext to deliver more features for less money. It’s a bit harder to monitor social media reputation manually. There are some free tools you can use depending on the social network. For Twitter, you can use a tool like TweetDeck. Just set up a column with your brand keyword and of course, keep it open and regularly check it. Twitter has the easiest method for monitoring. Other social media networks you have to use the search box to search for your brand name. It’s manual and difficult but it gets the job done and doesn’t cost anything. You can knock monitoring your brand on all of these out with one tool that’s free from Google. Google Alerts. I will warn you though that Google Alerts is horribly ineffective and seems to miss 90% of mentions on Google. I’ve had it set up for my name and brand for years and rarely ever get an alert. When I do a manual time-constrained search then I find all the gold. There is, of course, one really easy way to manage your business online reputation. That, of course, would be to sit back and do nothing except when something goes good or bad. OK, you definitely won’t get to sit back and do nothing. Your business won’t run itself, will it? You won’t have to worry about the monitoring part though. When something good happens you get to run in and be the hero. If something bad happens you’ll know about it immediately so you can take the necessary steps to mitigate the negative. Let Exprance manage and monitor your brand reputation everywhere on the internet. We will monitor your brand name (and any other keywords you’d like) in all the places I mentioned online. That way you’ll know whenever someone mentions your brand and whether that mention was good, neutral, or negative. You can check out our digital reputation monitoring solution to learn more. We make it so easy to monitor your business online reputation it should be criminal.